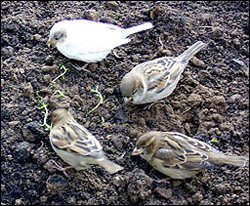 The white sparrow appeared among the sparrows in Minsk, Belarus. It has been said that white sparrows appear only once per 150 years. Some peoples of the world gave a great meaning to white sparrows. Native indians considered them something special. In old Russia such white sparrows were called “dukes” and they were considered magic birds. They believed that if somebody would see a white sparrow he can cast a wish and it would become true soon. So we publish a pic of a white sparrow here – you can cast a wish now! I have a little white sparrow living in my back yard. Apparently he has a condition known as Leucism. He would be considered to be extremely rare (according to the biologists) because he is completely white. Very interesting! Hello, I also have a white sparrow that nests with a very large flock of ordinary sparrows. It feeds at my feeders a couple of times a day. I would like to know more about it if anyone can enlighten me. It, by the way does not have red eyes, but they are brown, its bill is sort of blonde, otherwise its all white and charming. Thank you. I have chased a white English Sparrow around my neighborhood for the last few weeks and have gathered a nice collection of still photos. I may try to borrow a video camera so I can catch him in action. I was quite surprised to spot this little bird, pink eyes and all! i have just had a pure white sparrow in my garden, it had a pretty little yellow beak it was breathtaking to see such a bird! i waited over an hour with my camera at the ready but it has not called again but i will keep watching for it. i have caught the white sparrow on my camera yipee i feel so lucky have sent a copy of picture to our local newspaper and they say its as rare as winning the lottery! I to have a rare white sparrow visiting my feeder…I feel so blessed to see this little bird. So white and beautiful. We have had a white sparrow feeding at our place every day for 3 months in Kaikoura, and yesterday while travelling north to Rarangi saw another white sparrow at the South end of Blenheim – two in one day, just 130km apart. I also have a white sparrow feeding in my front yard. I saw it or one like it last year. It was like seeing a UFO. Unless you have pics, nobody believes. This year I finally took some pictures with my phone, not very good. I have a trail cam on it now, and see it most mornings. I sure hope I get a clear picture. I am located in Oklahoma.